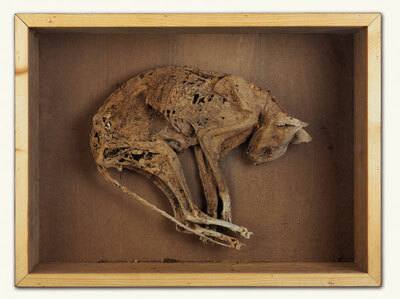 Many cat mummies seen in museums today were preserved naturally, but a good number of them were sacrifices. Religiosity, not curiosity, killed these cats. 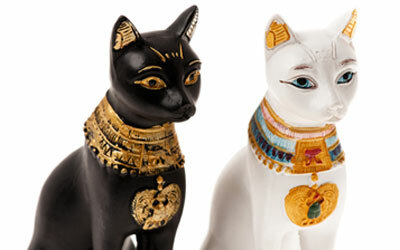 In ancient Egypt, cats and kittens were often killed and mummified to accompany their owners in death. 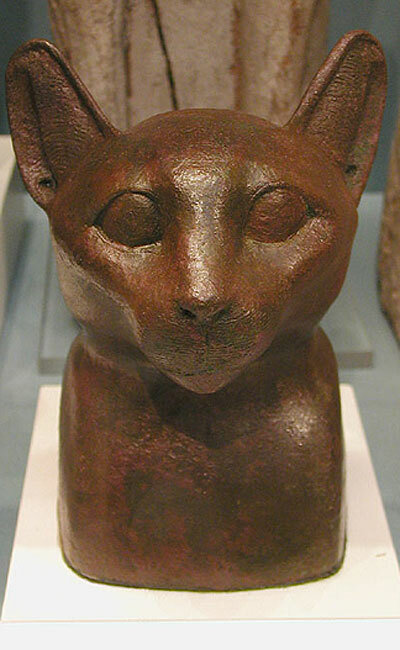 They were also very popular religious offerings, bought and buried by the millions at temples of the cat-headed goddess, Bastet, just as votive candles are bought and lit at cathedrals today. Their corpses were carefully washed, emptied of major organs, stuffed with a salty drying agent known as natron, then wrapped tightly with linen strips. 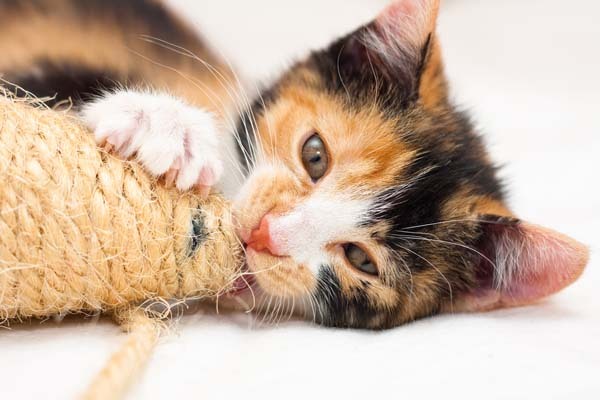 This practice was so common that the entire contents of ancient Egyptian cat cemeteries were ground up and sold as fertilizer in Europe during the 19th century. 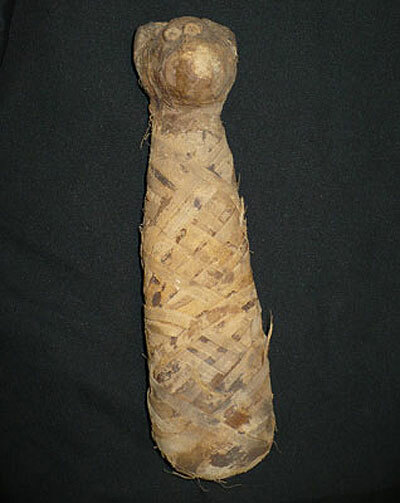 Mummification can happen naturally, too, as very cold, dry, and/or oxygen-deprived conditions are inhospitable to the bacteria that normally consume flesh. 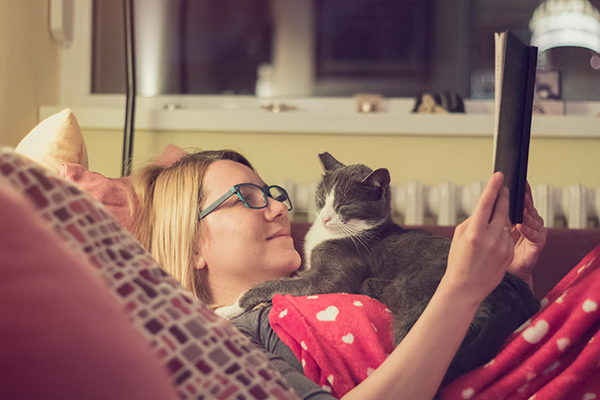 Thus some of the cat mummies we see here — populating the museums, private collections, art galleries and random glass cases of the world today — got that way accidentally. Others got that way as sacrifices: religiosity, not curiosity, killed these cats. 1. 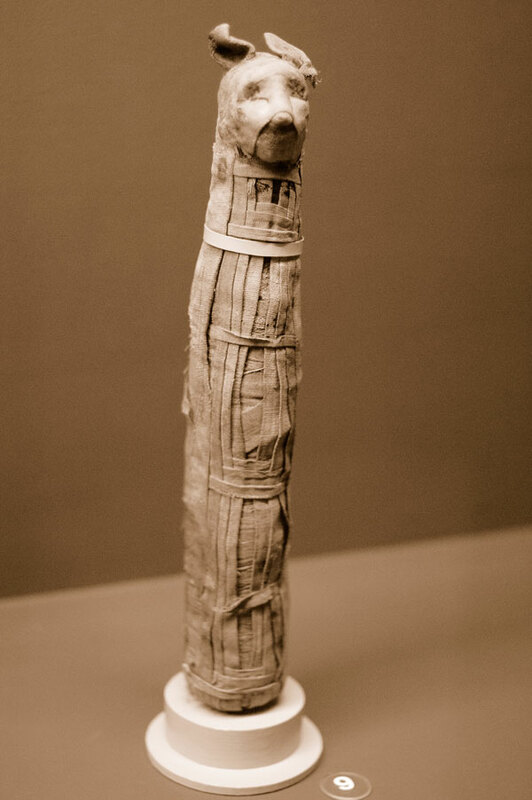 The British Museum has on display an elaborately wrapped kitty mummy, found at the main temple of Bastet in Bubastis, Egypt; also in the collection are cat-mummy paraphernalia such as a mummy case and mask. 2. Along with its beautiful stained glass and remarkable floor tiles, the Christ Church Cathedral in Dublin, Ireland, houses a mummified cat and rat, allegedly discovered together by workmen who were clearing out an organ pipe. 3. Two mummified cats adorn a wall at the Stag Inn in the historic English coastal town of Hastings. Found lodged behind a fireplace during 19th-century renovations, the cats might have been immured in hopes of dispelling evil spirits, as was long customary. 4. 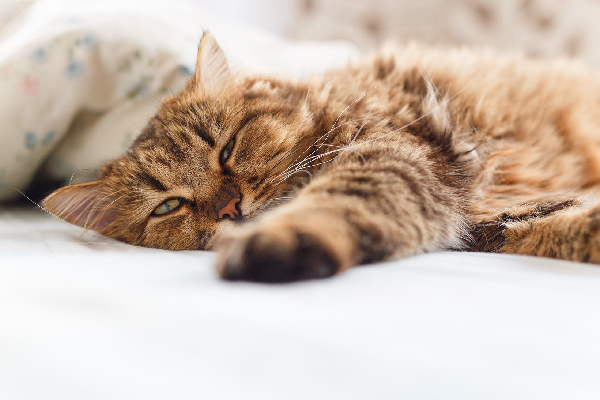 Cat mummies belonging to New York City’s Brooklyn Museum have been X-rayed and examined as part of a research project investigating ancient and modern cat populations, feline genomes and DNA. 5. The UK’s Bolton Museum has sent its 2,500-year-old mummified cat — shaped rather like a baseball bat — to Asia as part of its currently traveling “The Quest for Immortality” exhibition. 6. 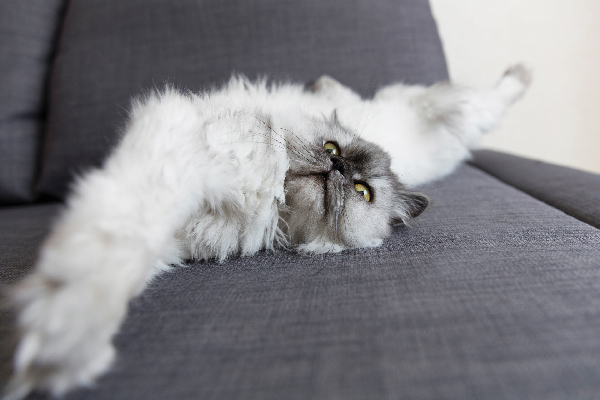 A mummified cat, allegedly found immured in the wall of an English cottage — and with testes still peeping out proudly between its legs even in death — is allegedly for sale via a London gallery. 7. 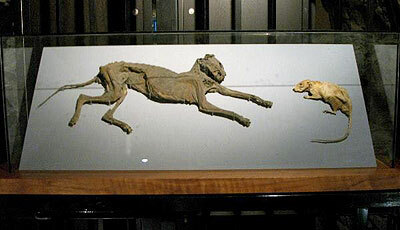 A skinny ancient Egyptian mummified cat belongs to the collection of the Rosicrucian Egyptian Museum in San Jose, California. Rosicrucianism is a Christian secret society that, according to its own annals, was founded by an Egyptian. 8. 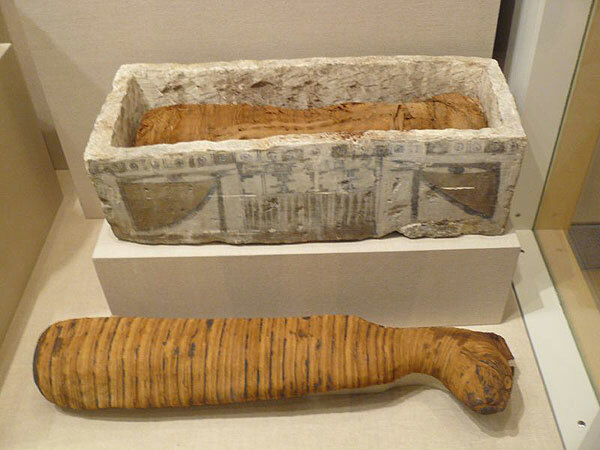 A sweet-faced, intricately wrapped cat mummy and its smaller, less cute companion in Canada’s Royal Ontario Museum probably date back to the Ptolemaic Period, 332-30 BCE. 8. 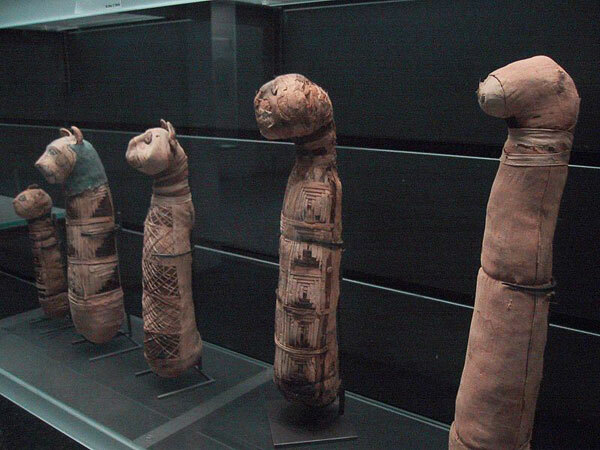 A group of mummified cats displayed at the Louvre in Paris includes some very well-preserved specimens, wrapped snugly in criss-crossing layers of linen and still graced with smooth cloth masks.